Lowest Fluridone Prices. 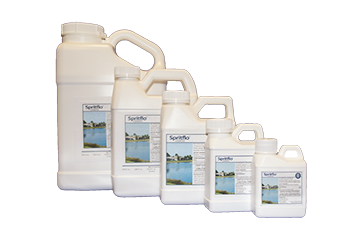 Eliminate duckweed and other aquatic weeds with Spritflo® herbicide. Great for ponds! Spritflo® herbicide (Fluridone) controls duckweed and nearly all submerged pond weed varieties, except algae. Great for entire bodies of water but not meant for treating a portion of a pond or lake. For a more complete solution, we recommend using additional pond weed control products to give your pond the healthy and beautiful look it was intended to have. Spritflo® Fluridone Herbicide is a great product for controlling duckweed and other aquatic vegetation. Spritflo® Herbicides main active ingredient is 41.7% Fluridone. Spritflo® is a direct substitute for Sonar As Liquid and Alligare Fluridone, for Less! Spritflo® Fluridone herbicide is a proven and popular active ingredient for controlling aquatic weeds in fresh water ponds. Spritflo® Fluridone Herbicide effectively controls a wide range of floating and submersed aquatic vegetation, including duckweed. A Lake Restoration, Inc. product. I used this product to kill watermeal and it worked well. Took a while but the stuff is hard to kill. The only complaint I have was the lack of application instructions. It does not work at all like Sonar. I used twice as much of the product as I use of Sonar and pond weeds are as bad as ever, 5 weeks later. Customer service is not helpful at all, with a condescending attitude. Weed is Hydrillia and I applied the product the same way I have Sonar or equivalent for the last 15 years. Price seemed too good to be true and unfortunately was. The is the second year I have used this product to kill off the beautiful yellow water lilies that like to take over our 1 1/3 acre pond. It works very well. I will use it again if they come back. We used Spiritflo (4 oz.) in our 1/2 acre pond to eliminate the duckweed. Two applications were applied 10 days apart. Within thirty days the duckweed was completely gone. Great product. I used Spritflo to eliminate hydrilla in my pond. After the ice went out in the spring, pieces of hydrilla were floating & you could see it growing in the bottom of the pond. I applied the product on May 5 & the hydrilla was completely gone in less than a month (I just did one application - I did not split them). It has also eliminated the small amount of duckweed in the pond & killed or stunted the grassy weeds that were growing. I have fish & frogs in the pond & they do not appear to have been affected by the herbicide. 1/4 ac 1 oz....effect! rather use half amt twice...april and june. my waterlillies and reeds get slightly variegated with this, dont spread, look natural otherwise.